This chair is available on Amazon. So follow the link and benefit from their efficient shipping service. This GigaTent Outdoor Quad chair is a folding and collapsible type which packs to its nicely designed carry bag with the dimensions (L x D) 38 x 8 inches (96 x 20 cm). But this is also a padded chair throughout the seat and the backrest. The backrest is high enough to give a headrest as well, see the picture below, you have 41 inches (104 cm) from the ground to the top. So I have included it in my list of chairs with headrest. You have a padded headrest here. This is not all, as you see from the picture above, you also have a footrest here. So this is a platform supported by poles and it is adjustable, there are buckles for this purpose. I have added it also to my list of chairs with footrest. From the pictures you see also that the chair is with soft armrests and one of them has an integrated cup holder. Size-wise, the dimensions are good, the seat is (W x D) around 21.5 x 15 inches (55 x 38 cm), and it is 16 inches (41 cm) above the ground. So it is not particularly high. When the footrest is deployed, it will take up to 48 inches (122 cm) from back to the front. Capacity-wise, it is rather modest, the declared capacity is 250 lb (113 kg). If you are a heavy person you might want to check some of these chairs for heavy people. Weight-wise, with 9.25 lb (4.2) it is reasonably light, you will see how it compares with some of its competitors, there is a comparison table below. The mentioned packed size is such that you need a car for transportation, but it is narrow when packed and it will not take much space. The carry bag shown in the top picture above is with a shoulder strap so you can carry it short distances. Capacity: 250 lb (113 kg). Dimensions (W x D x H): 22 x 22 x 41 in (56 x 56 x 104 cm). Seat height: 16 in (41 cm). Packed size (L x D): 38 x 8 in (96 x 20 cm). So I have decided to show this chair side by side with two others built in the same style with a footrest. You have some basic numbers but follow the links for more and for the updated prices, all are very affordable. 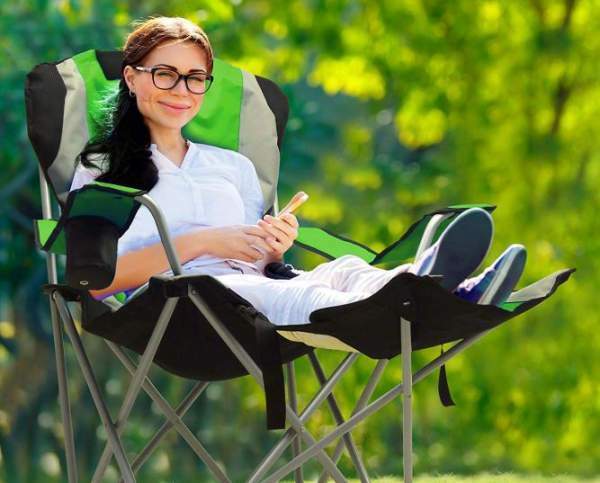 This GigaTent Outdoor Quad Camping Chair is nicely built and it has been on the market for at least 6 – 7 years so all is known about it and there should be no unpleasant surprises. It has several really useful features which you will like to have when camping. 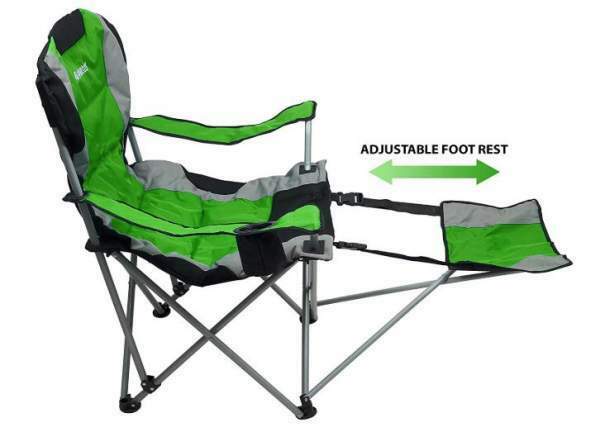 I have included it in my list with best padded camping chairs. Please note that this is not a sponsored text and I am not paid by the brand. Let us know if you have some experience with this chair, there is a comment box below.